The story picks up at the end of Tales of 1001 Arabian Nights, with Scheherazade now living a life of storytelling at the palace with her husband and Sultan. She is less enchanted with her position now as the nights have lingered on. Even more problematic is that the Sultan is not nearly as enthralled with her stories and at times barely listens to her. She soon discovers that it is in fact because the land is in rebellion and the Sultan is trying to deal with that. One night, she is awoken by the Grand Vizier who stumbles into the garden covered with blood, explaining there has been a revolt and the sultan was killed. She is named as Regent, being popular among the common folk and not soon after that, she executes the Grand Vizier claiming he was suspect with regards to the sultan's death. However, life as a Regent does not seem to make her happy and she finds herself trying to find storytellers to engage and entertain her in the evening. Unlike the Sultan, she does not threaten them with death, but merely cutting their ears off. With teller after teller, they all leave with missing ears until one evening when another storyteller enters the room. He is quiet but has a manner about him that captures Scheherazade. The story ends with her staring at him, he staring at her, and a silence holding between them. It took me a while to realize this was connected to Tales of 1001 Arabian Nights. I hadn't recognized the spelling of the name (though once I realized it, I remembered it was spelled this way). I found the ending ambigiuous because as we know she is searching for true love, we are left uncertain if she had found true love or her own death as the last line reads, "Yet Scheherazade hear the most wonderful story of all from those lips that did not speak, for she learned from them what love can tell in silence of the beauty of death and of life." It makes me wonder if this man had killed her or loved her...or both. I'm a big fan of stories that draw upon or build upon other tales. Call it is the serial reader in me that likes stories to go on, but there's also something to be said of one author trying to do something with a text that has long since been completed. One other point within this story that I was fond of and that was de Reginer's discussion of the differences of telling a story and writing it down. When Scheherazade is contemplating what to do with her free time, she says, "There remained the last resort of writing stories but Scheherzade knew that stories lose a great deal when they are written. Her tales would lack the sound of her voice, the grace of her gestures, and the mysterious smile of her eyes." This is in part why I'm such a big audiobook is the ways in which the text comes alive. 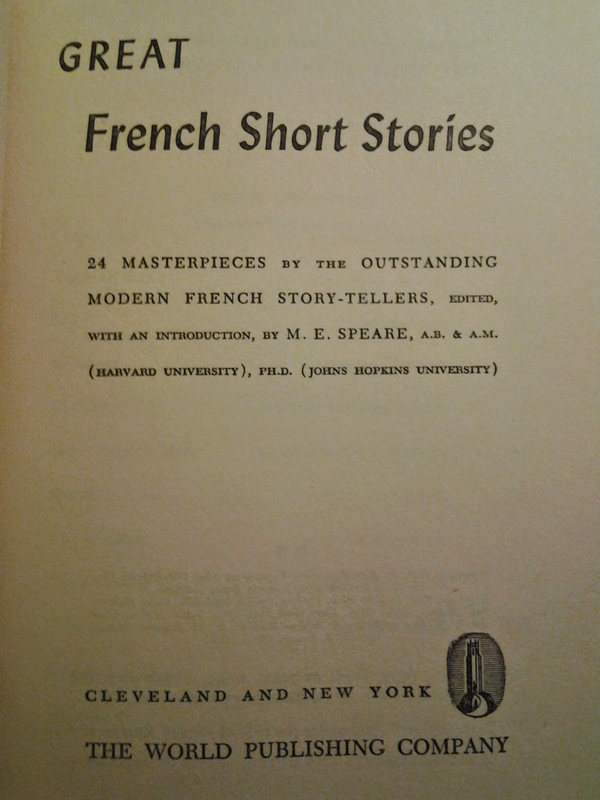 Source: Great French Short Stories edited by M. E. Speare. The World Publishing Company, 1943. You can find this story and others in this anthology at this resource.